Dave Nellist, one of Militant's former Labour MP's, now Socialist Party Councillor and former Socialist Alliance chair, launches the May 2001 Election challenge. - Preface to The Rise of Militant by Peter Taaffe. - Editorial from the first Issue of the Militant. Subscribe to The Socialist, successor to Militant. The Socialist Party website is updated weekly with the latest news, policies and Marxist analysis selected from features carried in the weekly The Socialist newspaper, and other Socialist Party publications. The Militant began building a worker's international in 1975, and today the Socialist Party is affiliated to the Committee for a Workers International (CWI), which fights for socialism in 35 countries world wide. "An incident outside a factory illustrated what Militant was all about. A supporter sold the paper outside this factory to a regular group of workers. Over a three-week period he observed that another individual from the factory stood watching, noting those who bought the paper. Fearing that this was a management "nark" or supervisor, the seller approached this individual. Rather than being a management stooge he stated that he was in fact the chief shop steward, i.e. the convenor of the workers in the factory. He was observing those who bought the Militant, because he wanted to identify those workers capable of becoming shop stewards! " Now serialised on the Socialist Party website. Written by Peter Taaffe and published in 1995, The Rise of Militant is the first real account of Militant, its ideas, organisation and the role of prominent public figures associated with it, written by its leading exponent for over40 years. THE IDEA for this book arose when Militant was discussing how best to celebrate its 30th anniversary in October 1994. One suggestion, successfully carried out in October and November of that year, was for a national speaking tour by myself, together with Tommy Sheridan and others. A series of very successful meetings was held in all the main areas of Britain. At the same time it was suggested that I should gather together the main articles from Militant�s 30year history, for publication in a small book. However, once I began to investigate the viability of such a project it became clear that the publication of a few "representative" articles would not do justice to the subject. Thus the idea of a book celebrating our 30 years of publication took shape. However, the very scope of such an undertaking - compressing the events of 30 years into one volume - proved to be a much more formidable task than I anticipated. This book could not be produced at "leisure". As general secretary of Militant Labour, I am in a position which demands intense day-to-day involvement in the activities of this organisation. Therefore the writing of this book had to be "fitted in" alongside the more pressing daily tasks of building Militant Labour and participating in the struggle. This is the main reason for the delay in publishing. Another reason for delay was the difficulty in editing and selecting for publication those extracts from Militant�s history which best reflect its political position at each stage in its development, as well as the continuity of thought and approach which determined its political approach. This book is not primarily an "organisational" account of Militant�s evolution. Some organisational details are included but these are kept to a minimum. This is because the aim of this book is essentially to trace out the ideas which motivated Militant and its adherents first to undertake publication of the newspaper and then to sustain it, in good times and bad, over a 30-year period. Right from its inception, Militant has been scrupulously democratic, both in its organisation and in its approach towards its political opponents in the labour movement. Decisions, including the one which led to the publication of Militant, were determined democratically by committed supporters. Those who paid money regularly to Militant and were involved in our local discussion groups determined its policy. Leading "Militants" did not have a vast apparatus or mighty resources compelling obedience to its political line. Decisions were arrived at through discussion and debate. At the outset there were a number of leading supporters, based in London, who constituted the National Editorial Board (NEB), who held positions of authority and respect within Militant�s ranks. They were elected and subject to recall at any time. At the time when Militant was launched and for a period afterwards these leading members were Ted Grant, Peter Taaffe, Keith Dickinson, Clare Doyle (who joined a little later), Ellis Hillman (who subsequently parted company from Militant) and Arthur Deane. Small forces were involved at the beginning. But decisions were only arrived at after intense discussion and debate. Indeed, the intensity of the debate in the Marxist movement sometimes is in inverse proportion to the number of participants! The most controversial aspect at the beginning was over the name. The choice of Militant was not initially favoured by many. But the market place for "revolutionary names" is very crowded, which makes the choice of a name for a new publication very difficult indeed. However, the name Militant had an honourable pedigree in the history of the Trotskyist movement. It had been the name of an earlier, very small, Trotskyist group, in Britain. It was also the name of the newspaper of the American Socialist Workers Party, which worked closely with Trotsky in the 1930s. However, by the early 1960s the leadership of the US SWP was at variance with the leaders of what became Militant in Britain. For this reason, if no other, most of the pioneers of Militant were not enthralled by the choice of this name. It was accepted at the time, largely because no other viable alternative was on hand. But in the psychology of human beings, names, both of individuals and organisations, become associated in the mind with what they come to represent. And in one important respect the name Militant did stand for what its proponents intended: the aim of winning in the first instance, the most conscious, combative, fighting, i.e. militant, sections of the working class. An incident outside a factory illustrated what Militant was all about. A supporter sold the paper outside this factory to a regular group of workers. Over a three-week period he observed that another individual from the factory stood watching, noting those who bought the paper. Fearing that this was a management "nark" or supervisor, the seller approached this individual. Rather than being a management stooge he stated that he was in fact the chief shop steward, i.e. the convenor of the workers in the factory. He was observing those who bought the Militant, because he wanted to identify those workers capable of becoming shop stewards! Those who were prepared to stand out, who in turn were those who were prepared to buy Militant, were leadership material in the eyes of this convenor. Like the convenor of this factory, but from a broader point of view, Militant set its sights in the first instance on the more conscious, politically aware sections of the working class. The winning of these layers, who we consider are "the salt of the earth", is the key to winning the mass of the working class at a later stage. Militant, through deeds as well as words, became, in time, a substantial force within the British labour movement. In the beginning, however, small forces were ranged behind Militant�s banner. But the history of the Trotskyist movement in Britain did not begin with Militant. There is a long tradition going right back to the 1930s and Trotsky himself, of Trotskyist groups and organisations which endeavoured to find a base within the labour movement and the working class. 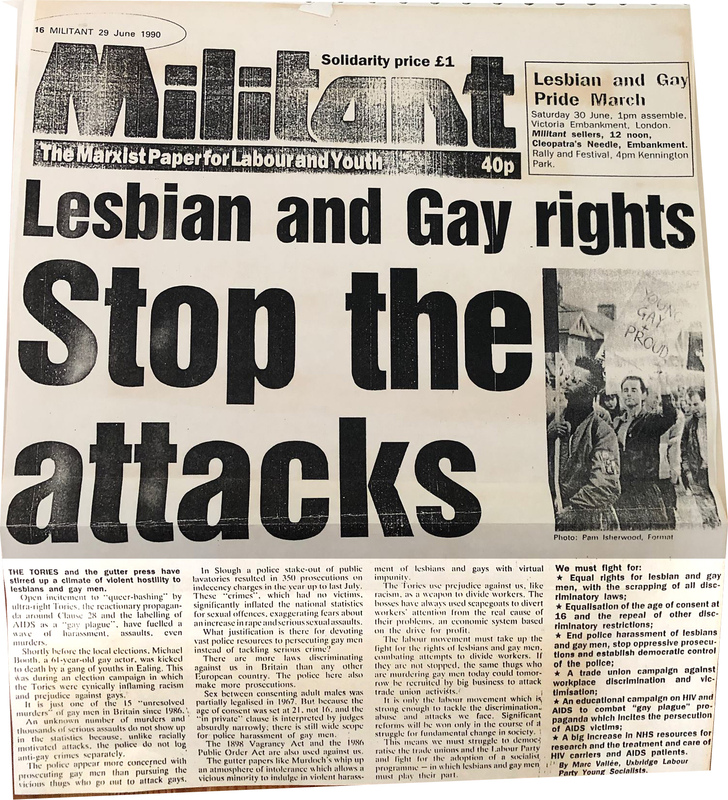 Some of those who helped to form Militant, such as Ted Grant and the Deanes (Jlmmy, Gertie, Brian and Arthur), had been involved in the Trotskyist movement for decades. The author does not subscribe to the view that the struggles of small groupings are of no historical significance. As Trotsky pointed out, the theoretical battles which were fought out amongst small groups of Russian revolutionaries in exile, in the back alleys of Paris, the pubs in London or flea-infested barns in Brussels were part of a necessary process, sharpening the political weapons without which the greatest social overturn in history, the Russian revolution, would not have been possible. Without the struggles of past generations of Marxists, particularly the pioneers of Trotskyism in Britain, the success of Militant would not have been possible. The youthful adherents who joined the ranks of what became Militant in the early 1960s, stood on the shoulders of those who maintained the Trotskyist tradition in the most difficult period. However, it is not the intention, nor is it possible within the scope of this work, to deal with this history. Others will have to fulfil that task. The purpose of this work is to show how Militant was able to move from "just another" small group into a force able to weld the ideas of Marxism to mass movements of workers. Militant, it is true, did not arise fully formed. A preparatory period of assembling new cadres, particularly in the early 1960s, had been undertaken before the launch of Militant was possible. Merseyside was an area where Trotskyism, in the form of those who subsequently supported the formation of Militant, had put down firmer roots than elsewhere in the labour movement and the working class. Within the Labour Party the Walton constituency was the only one in which the Marxists were able to achieve any appreciable success. Year after year they argued the case for the general programme of socialism, both at the level of the Liverpool Trades Council and Labour Party, which was then a joint body, and at national Labour Party conference. Walton Labour Party remained a stronghold for the forces of Marxism in the late 1950s. In 1959 George McCartney, a supporter of Socialist Fight (the forerunner of Militant), was selected as Labour's prospective parliamentary candidate for Walton. In this battle he easily defeated Woodrow Wyatt, then a supporter of Tribune but now a rabid right-winger. Unfortunately the 1959 general election, against all expectations, was a victory for the Tories. Despite a tremendous campaign, Labour failed to win Walton. Among those who joined Walton Labour Party in 1957, thereby coming into contact with the ideas of Marxism, was Keith Dickinson, one of the five Militant Editorial Board members expelled from the Labour Party in 1983. Many others played an important role in the development of the forces of Socialist Fight. Pat Wall, who had been secretary of Garston CLP at the age of 16 back in 1952, played an important role, as did Don Hughes, Pauline Knight (who subsequently married Pat Wall) and a group of printers including Reg Lewis and John MacDonald. I came into contact with Socialist Fight in 1960 initially after meeting Don Hughes. Before then, support for CND was combined with a keen interest in the basic ideas of socialism and what I imagined was "communism". After attending a Labour Party public meeting I was contacted by John MacDonald from Socialist Fight. At that time a ferocious battle was taking place within the Labour Party Young Socialists on Merseyside between the adherents of Socialist Fight and those who subscribed to the ideas of the Socialist Labour League (who subsequently became the Workers' Revolutionary Party). I was invited to meetings of the Socialist Labour League, and had discussions with their Merseyside organiser. Why was I attracted to the much smaller Socialist Fight? With very little experience in the labour movement I was nevertheless repelled by the narrow political sectarianism - not to say authoritarianism - of the SLL. We record later how the supporters of Socialist Fight won a majority within the Young Socialists. However, with the decision to publish Militant, it was also decided that I be moved from Merseyside to London to become the paper's full-time Editor. I was promised a �10 weekly wage and secure accommodation. However, the accommodation and the �10 wages remained on the plane of "theory", never actually materialising for years. In the well-worn tradition of Marxists and revolutionaries, I was compelled first of all to sleep on the floor of a supporter in Balham, south London. But when a small factional dispute took place, I found myself locked out of this room, sometimes forced to sleep on other people's floors and once or twice spending sleepless nights in the entrances of subways, before finally a decision was taken that I should sleep "illegally" in an office which Militant had rented from the Independent Labour Party (ILP). I was compelled to do this for six months in what became an almost cat-and-mouse existence with the caretaker of the building. Not entirely enamoured of Trotskyists, this individual arrived at the ILP headquarters very early every morning to run the ILP bookshop which was located in the basement. This character spent a large part of his time, between 7 a.m. and 9 a.m., trying to catch me sneaking from the first floor office out of the door to take a wash in the public toilets just over the road. Fortunately, the agility of youth had an advantage over older legs and the cat never actually caught the mouse! This precarious existence, both financial and personal, would not have been possible without the help of committed supporters of Militant. Militant International Review (MIR) from 1969 onwards was our main theoretical journal. It was first produced intermittently. In time it became a quarterly, then a bimonthly. In 1995 the MIR was replaced by a new monthly journal Socialism Today, edited by Lynn Walsh. The articles in these journals contain some of the most detailed and penetrating insights into British and world developments over the last two or three decades. From 1985 Clive Heemskirk, who gained invaluable experience as Militant student organiser from l981-85, played an indispensable role alongside different editors in the production of our theoretical journal including our new monthly. There are many very good comrades who over 30 years have made a big contribution to the building of Militant and who I have not been able to mention in this work. My sincere apologies to them; due weight will be given to all of them when a more detailed organisational as well as political history will be written about Militant in the future. But I hope they will forgive me for mentioning the contribution of Linda Taaffe. She joined me in London in 1966. Since then, both on a personal level, and politically, she has been steadfast in the cause of socialism and Marxism. To all who know her, and particularly to the author, obviously, she has always been a source of encouragement and love, always demonstrating supreme confidence in the goals which we are struggling for. And now that century has come! What has it brought with it at the outset? It seems as if the new century, this gigantic newcomer, were bent at the very moment of its appearance to drive the optimist into absolute pessimism and civic nirvana. - Death to Utopia! Death to faith! Death to love! Death to hope! thunders the twentieth century in salvos of fire and in the rumbling of guns. - Surrender, you pathetic dreamer. Here I am, your long awaited twentieth century, your 'future". Rotting capitalism is incapable of showing a way forward either for the British or the world working class. Nor can the right-wing Labour leaders show a way out of the impasse. World socialism is the only way of preventing social and political, as well as environmental disaster, on a monumental scale. Consciousness of what needs to be done lags far behind what Marxists call the "objective conditions" of capitalism in Britain and on a world scale. This contradiction, however, cannot last forever. Consciousness will catch up with these objective conditions. When that happens there will be huge leaps in understanding, particularly by the working class. In the course of such movements the ideas of Militant, which have already given a glimpse of what is possible for the British working class, will become the political weapons through which the labour movement and the working class will carve out a new world.